Making Mischief of One Kind and Another: Wild Things! If you follow The Niblings (via Twitter or Facebook), you’ll know that two of us — Betsy Bird (Fuse #8) and Julie Walker Danielson (Seven Impossible Things Before Breakfast) — have co-written a new book, Wild Things! : Acts of Mischief in Children’s Literature. It’s out today! It’s great! Go get it! 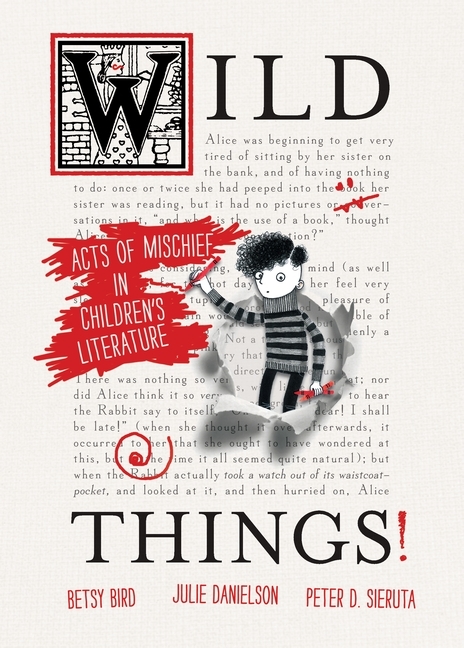 With tales of banned bunnies, drunken ducks, and gay penguins, Wild Things! leads the battle against the ignorance, half-truths, and just plain foolishness that afflict so much writing about children’s literature. Punchy, lively, and carefully researched, the book is a must-read for anyone interested in books for the young. So. Stop reading this blurb, and buy the book. Yes, that’s me, in my blurb. There are other even more notable blurbs, from the likes of Lane Smith, Jack Gantos, Jon Scieszka, Jules Feiffer, Andrea Davis Pinkney and Brian Pinkney. But you don’t have to believe the blurbs. (I mean, I don’t know why you’d doubt any of us, but you could doubt us, of course….) For the past month, they’ve been posting the deleted scenes — the many great stories that did not fit in their entertaining book — on the Wild Things! Tumblr. You can learn of famous feuds in children’s literature, and great children’s books that were almost never published, and many other things. The stuff in the book is even better. They also have a piece in today’s Huffington Post (in which Trina Schart Hyman gets up to mischief). And there’s an interview over at the Let’s Get Busy! podcast (where you’ll learn, among other things, where Fuse #8 got its name!). Since I haven’t yet figured out a way to include the book’s third co-author, Peter D. Sieruta, let me do that here. He passed away a couple of years ago, while the book was in its editing phase. But you can still read his blog. So. To conclude, the book — which I read an ARC of, last October — is out. Let’s de-romanticize children’s literature! Unleash Wild Things! in your libraries, classrooms, and homes!